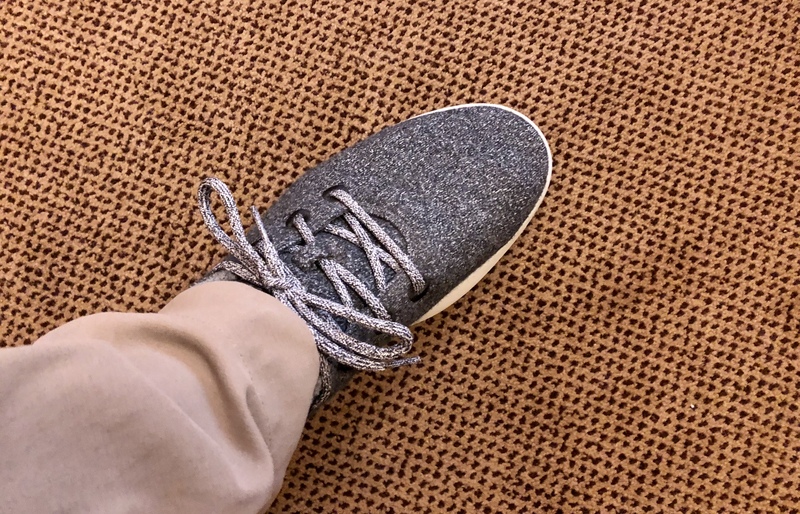 I’ve resisted Allbirds Wool Runners for a long time, because unlike most other items we talk about on this site, shoes are not really lacking for innovation. It is true that you can still buy heritage leather shoes made in much the same way as they were years ago. It’s true that the materials likely have not changed much on those. But it’s also true that the vast majority of athletic shoes from Nike, Adidas, and New Balance utilize some very complex and technical methods of production and materials. So unlike shirting, shoes are fairly easy to find “something better” in. However, shoes are also problematic as they represent so much more: they need to support your foot, be comfortable, protect your foot, and offer some mix of a fashion statement. You can just as easily wears a pair of Red Wings as you can a pair of Flyknits with your blue jeans. However, a year ago I wore out my Nikes (yes I keep only one pair of casual shoes) and needed something new. Since I love merino wool, I felt I owed it to myself to try out the famous Allbirds. The first thing you will notice about Allbirds is that they come only in whole sizes. Allbirds offers a sizing chart to help you select which size you should order. Typically I wear a size 11.5 in something like Nike, and on my first go with the sizer it said to get size 11. This was much too tight and I had to exchange them for size 12. Since then their size chart has changed and now correctly states I should order a size 12, so it seems to sort out the lack of half sizes. Steve, however, was unable to find a fit that worked for him and ultimately returned his pair (due to either the narrowness of the mid-foot or the arch height/placement). I would say the Allbirds I have are about a half size too large, but not so large that I cannot comfortably wear them. So going into it, you should know that you might not find a size which works for you. Your best bet is to try their online size tool and know that the return policy is solid and fast. The thing about these shoes is that they look like slippers. You can see where your toes are. They have an overly wide tongue opening. The laces are very thick and chunky. These are perhaps the most casual shoe I have ever owned, to the point where they feel too casual if you are wearing anything nicer than a t-shirt. Most of the time we steer clear of commenting on style here, but Allbirds Wool Runners warrant such commentary. They don’t look great. They are too casual. Shoes make statements and the statement these shoes make are: I care more about comfort. Like wearing basketball shorts or sweat pants out and about. This is the pitch with these shoes: “Just the world’s most comfortable shoes, made naturally and designed practically.” It’s important to note how they come about this comfort. By using thick merino wool, the shoe has all the normal merino properties. It breathes well, dries fast, resists odors (killer feature for a shoe), and in begins to form to your foot. Allbirds combines this with a very cushy and soft sole to make something which really does feel more comfortable than a house slipper. All of this means that you can wash these in a machine and wear them without socks. I’ve worn and walked in mine for quite a while now (a year) and the one thing I can say is the the comfort hype is real. The only time I have found these shoes uncomfortable is when driving my manual transmission car, as the heel doesn’t quite have the stiffness needed for certain theatrics of the foot. Lastly, the shoe wears a tad warm, which means your feet will sweat a bit more. However,sweat dissipates quickly because of the merino, so they are very comparable to the Nike Internationalists I used to wear, with the benefit that my feet cool off and dry faster. Simply put: these are absurdly comfortable for most of life. At the start of this review I mentioned that shoes play a role in style as much as comfort. I also mentioned that they should support and protect your foot. That’s the area where Allbirds fail. The soles are simply too slick on wet ground to do much good. While the wool dries fast, you cannot add any water repellency beyond what is naturally there, which makes them doubly bad for wet weather (slippery and wet feet. No thanks). On top of that, they offer less protection for your toes as there is only a bit of wool there. There’s also a lack of foot support such that “running” in wool runners is not a thing you will want to do. These are wool walkers, and mostly for dry city sidewalks. I would not want to wear them on a nature trail, and I don’t wear them when it rains. Talking about San Francisco — man, this city is a cliche wrapped in a punchline and nothing represents it more than the stupid Avocado Toasts and Allbirds shoes. He goes on to have some harsh words about how Allbirds look, and I cannot disagree with that. I really do not like the way your foot itself telegraphs through the material. The complete lack of rigidity makes for something very comfortable but ugly. They are light weight, and pack well for travel. But they are not stylish. I know why people love these shoes, because that comfort is hard to ignore especially at this price. They also seem well built and like they will last, as mine still look new. However, when they wear out I will not be buying another pair. I’ll get some Nikes instead. That said, their Wool Loungers might be my next house slippers.